1. Heat olive oil in a frying pan and brown the meat and onion. 2. Add the water and rest of the ingredients. Bring to a boil them simmer for 20 minutes. 3. Heat the taco shells as per instructions on the packet. 4. 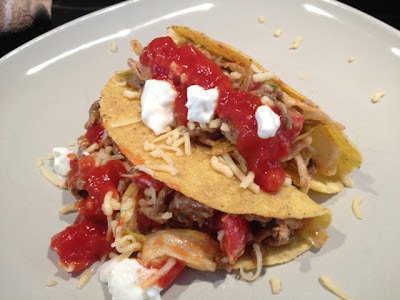 Spoon the meat and basically any veggie you like into the taco shells, and top with taco sauce and sour cream and grated cheese. Eat right away and serve with Desperado!